Plot Summary: A romantic comedy set in the world of 1920s football. WINSTON-SALEM, N.C. -- Some Triad residents told WXII 12's Angela Pellerano, they skipped worked Wednesday trying to get a glimpse of George Clooney. When "Leatherheads" finally hits the big screen, people from the Triad will notice many locations in the new film. Some scenes were shot in Winston-Salem, Greensboro, Rural Hall, Spencer, Salisbury, and Charlotte. Hollywood is all over the Triad and star gazers are trying to get a glimpse of the action. George Clooney recently called sexiest man and Renee Zellweger are starring in a new 1920's comedy called "Leatherheads". George Clooney plays Jimmy "Dodge" Connolly and directs the film, Renee Zellweger plays Lexi Littleton and John Krasinski from the NBC hit show "The Office" plays Carter Rutherford.Copyright 2007 by WXII12.com. A not so good video clip taken on the set of George Clooney, filming the movie Leatherheads in Greenville, SC, since the official movie clip isn't available yet. George serves as director, co-writer, and co-star. Oscar® winners George Clooney and Renée Zellweger match wits in "Leatherheads," a rapid-fire romantic comedy set against the backdrop of America's pro-football league in 1925. Clooney plays Dodge Connolly, a swaggering, aging football hero who is determined to guide his team from bar brawls to packed stadiums. But after the players lose their sponsor and the entire league faces certain collapse, Dodge convinces a college football star to join his ragtag ranks. The captain hopes his latest move will help the struggling sport finally capture the country's attention. Welcome to the team Carter Rutherford (John Krasinski), America's prodigal son. A golden-boy war hero who single-handedly forced multiple German soldiers to surrender in WWI, Carter has dashing good looks and unparalleled speed on the field. But if Dodge thinks this new champ is too good to be true, then Lexie Littleton (Zellweger) can prove that's the case. A cub journalist playing in the big leagues, Lexie is a spitfire newswoman who sniffs holes in Carter's war story. While she digs, however, the two teammates become off-field rivals for her affections. As the love triangle grows, Dodge fights to get the girl while he tries to keep his guys together. And if Connolly is certain of one thing...it's that you always keep one final play from the defense. 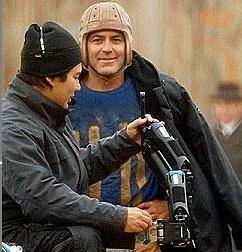 In addition to his duties as director and star, George Clooney serves as one of "Leatherheads'" writers.